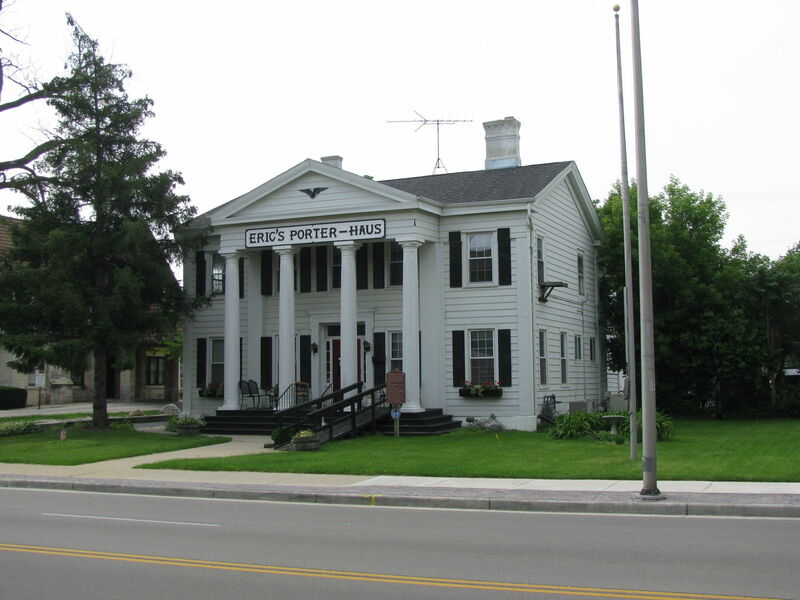 Greek Revival Home repurposed to American Legion Hall and restaurant. The Lain-Estburg house is located at 229 Wisconsin Avenue, Waukesha, Wisconsin. It was built in 1848 at which time Waukesha was known as Prairieville. The first owner was one named Issac Lain. He termed himself a house builder, so it is summised that he built the house for his own use. But who his architect was is a mystery. It is firmly believed that such an individual was on the job because the house has all the way thru bears evidence of the keenest study having been given to its various elements. There area two of three houses in the city of Racine which parallel this house very closely. A local architect by the name of Lucas Bradley was responsible for the design of these. He was trained in the east and emigrated to Wisconsin while still a young man. His work shows the hand of a master of detail and design. The same earmarks are to be found in the houses in both Racine and Waukesha. These two cities are not so far apart but that architect Bradley could have carried on his activities in both. From facts at hand it is learned that the more intricate woodwork at the Racine houses was made up in the city of Buffalo. Then this was shipped via water to the city of Racine. This pertains more especially to the large monumental columns at the main portico. The same might have been the case with the Lain-Estburg house also, because it seems a mystery how the columns at this house could have been made up in the little village of Prairieville prior to the Civil War period. The exterior of the house remains much today as when originally built. The interior, however, has been changed considerably, the greatest alteration being the removal of the central hall and staircase to a new location. This change was made approximately in 1900. The interior has many things in common with the exterior. The mouldings are well designed and the door and window opening have been cased with trim which has been detailed to match the general character of the exterior of the house. The first story is extremely high. The exterior of the house is the outstanding feature of the structure. Here the designer apparently let himself out. The mass of the building is splendid. It is stately and dignified. Besides this the details are exquisitely wrought, so much so that they bear the closest inspection. The mouldings are all hand cut and as free flowing and graceful as can be found at any old building anywhere in the state. As a contribution to the Greek Revival architecture of the northwest states, this house can well hold its own. It has all the earmarks of the best features of this style which Thomas Jefferson tried so hard to make the style of all structures of the states regardless of their use. With Palmyra, Ixonia and Sparta named after Greek cities, so, too, an attempt was made to transplant the architecture of Greece on American soil. And consequently we see today Greek Temples dating from the period of the 40's, or before, dotted all over Ohio, Michigan, Wisconsin and New York state. Wisconsin's contribution ranks well with those of other states. The Lain-Estburg house is one of those. The house is now (1935) in the hands of an owner who has given it the attention that it rightfully deserves. This is the E.R. Estburg family who have occupied it since 1899 or thereabouts.